U.S. Vice President Mike Pence is not ruling out a meeting with North Korean officials during his trip to South Korea to attend the Winter Olympics. Pence was asked about the possibility of U.S.-North Korea talks before leaving Monday on his six-day Asia trip. "Let me say President Trump has said he always believes in talking, but I haven't requested any meeting," Pence told reporters. He added, "But we'll see what happens." His words were very similar to comments that U.S. Secretary of State Rex Tillerson made Monday. When asked about possible talks between Pence and North Korean officials, Tillerson said "we'll have to see what happens." 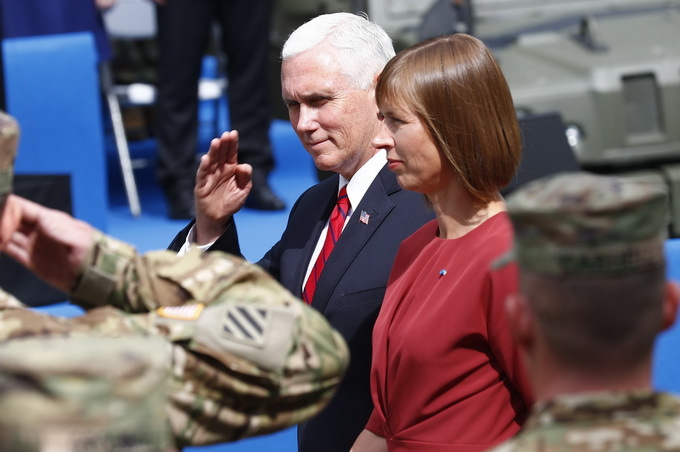 Pence spoke with reporters after visiting U.S. missile defense facilities at the U.S. Joint Base Elmendorf-Richardson in Anchorage, Alaska. The base is used to monitor missile activity by North Korea and could respond to any possible attacks. The vice president said if he does meet with any North Korean officials, he will tell them their country "once and for all" must give up its nuclear weapons and missile programs. Pence is holding talks with officials in Japan before going to Seoul. In South Korea, Pence will meet with President Moon Jae-in. He will also visit a memorial to 46 South Korean sailors killed in a 2010 underwater missile attack blamed on the North. He will then lead the official U.S. government delegation attending the opening ceremony of the Winter Olympic Games in PyeongChang. The Games begin February 9. Pence wrote about his upcoming trip to the Olympics on Twitter. One goal, he said, will be to repeat a U.S. promise "to continue to isolate North Korea and ensure North Korea doesn't use the Olympics to paper over the truth about their regime, which oppresses its own people and threatens other nations." Fred Warmbier, the father of American student Otto Warmbier, will be attending the opening ceremony as Pence's special guest. Otto was jailed in North Korea for 17 months and died last year shortly after being released and returning to the United States in a coma. He agreed to paper over the cracks for the period of the election. 5.U.S. Vice President Mike Pence is not ruling out a meeting with North Korean officials during his trip to South Korea to attend the Winter Olympics. We are not ruling out more arrests. While retired from the NBA, he said he is not ruling out playing overseas. 6.The vice president said if he does meet with any North Korean officials, he will tell them their country "once and for all" must give up its nuclear weapons and missile programs. We have to resolve this matter once and for all. We must take off the kid gloves and smash these evil monsters once and for all.